Khun Phaen Prai Kumarn 3 Kumarn Tong (Ongk Kroo) – Pong Prai Maha Sanaeh in Metta Oil – ‘Run 2’ – Yant Look Om, 20 silver Takruts, 2 real pearls – blessed by 5 Top Masters of Maha Sanaeh! Empowered by 5 of the Current Day Greatest Master Guru Monks of the Maha Sanaeh and Metta type magic. This Special 5 Masters Edition was made as a single and first Edition ever made of these amulets, but after immense demand from the Devotees, the masters agreed to incrrease the number of amulets by releasing a second Bonus edition. These amulets are the hit of the decade, which have the Incantations and Jhanic Empowerments of My personal Top Five Chosen Masters of Choke Lap, Metta Mahaniyom, and Maha Sanaeh type amulets. Destined to become all time classics and most certainly Essential Rarities which will become immensely rare in future years, due to the unlikeliness of any Devotee wishing to part with his prized amulet. Their power of Maha Sanaeh goes unquestioned. If ever there was a powerful line of Maha Sanaeh Khun Phaen Kumarn amulets, this is it.. The second bonus edition differs very slightly from the first batch. The Kumarn lying down below the lotus throne for example, is laying on his side instead of his back, and the rear face of the amulet has a different Yantra (Yant Look Om instead of Yant Grao Paetch). Yant Look Om is more Metta orientated than Yant Grao Paetch which offers more of a Protective aura. The Buddha on the front face is also different posture (Mara Wicha – Conquering Mara Demons) to the first edition (Pang Samati – Meditation Posture)Each Master gave their best Magical Ingredients, and Sacred Powders to be used for the Sacred Mixture of Muan Sarn Pra Khun Phaen. Each of these Masters are already very Old and have gathered the most powerful and rare Sacred Ingredients and Prai powders throughout the decades as they grew in Powers and were given magical items from their Kroo Ba Ajarns as the years passed. Now we have then this irrepeatable chance to make Bucha to such a powerful gathering of Masters to Collaborate in Making an Effective and Classic range of Pra Khun Phaen amulets, with one of the best mixtures of Muan Sarn to be created. 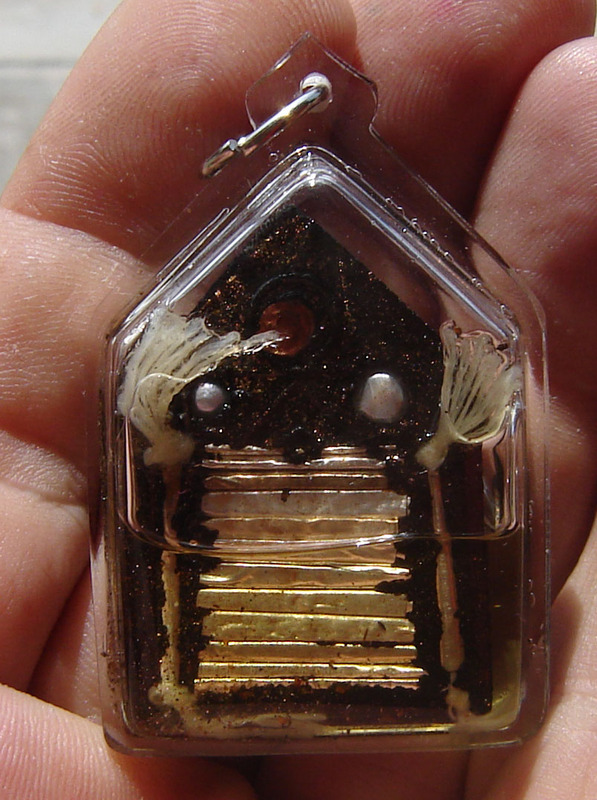 Luang Phu In Khematewo – Donated Pong Prai Kumarn Powders, which he made and empowered over ten years, and gave these amulets a seventeen day and seventeen night personal empowerment. Luang Por Bpan Gadtabanno – Donated Pong Sariga Gariang Kor Ma Powders, and gave a personal Empowerment with his Gariang Kor Ma Wicha which have made his Paetch Payatorn and Khun Phaen Tewada amulets so popular and successful, during a Nine Day and Nine Night Solo empowerment period. 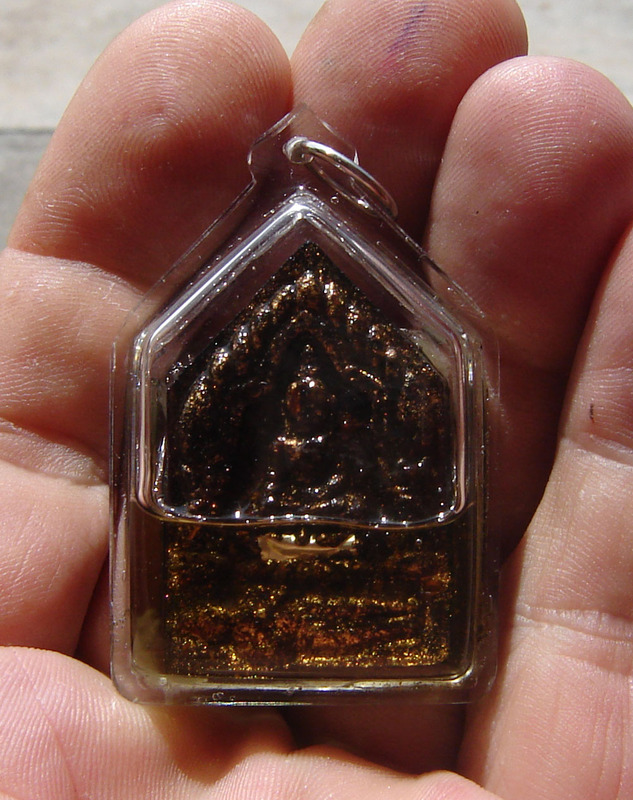 Luang Por Khern – Donated Ya Pong Saneh Ya Faed (Kumarn Tong Twins Powders), and Gave a Fifteen Day and Fifteen Night Empowerment in Solitary for these Special Edition Khun Phaen Prai Kumarn amulets. Luang Por Goey Chudtimanto – Donated Pong his famous Pong Maha Sanaeh, Pong Sanaeh Jantr (Mooncharm flower powders and pollens), Pong Gesorn Dork Tong (a very rare and powerful magical flowering herb which has immensely potent Maha Sanaeh qualities). Luang Por Goey recieved the amulets again after creation and gave them his own special incantations and empowerments using his famously effective Magical Wicha sanaeh jantr for a period of 11 days and nights. This amazingly rich in Metta and Maha Sanaeh sacred powders edition of amulets with quintuple empowerments from Thailands most powerful Metta Maha Sanaeh Masters is a historic amulet of wondrous proportions and stature, despite their modest size. 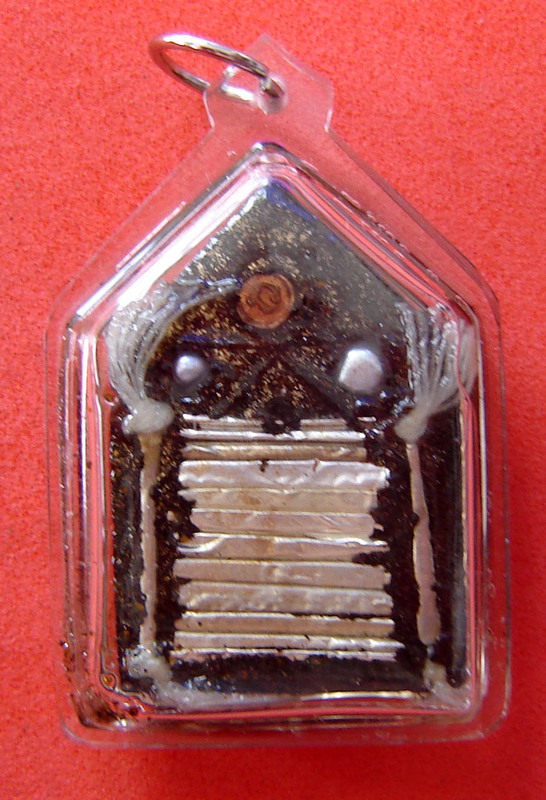 In addition to the already amazing sequence of empowerments and the richest mix of sacred Maha Saneh Sacred Powders imaginable being used for the Muan Sarn mixrue, each and every single Takrut spell which is inserted into these amulets was given a previous individual empowerment by Luang Phu in and Luang Por Khern. A Look Namo Spell and 2 real Pearls can be seen inserted in the back face. Yant Look Om is engraved in Ancient Khmer Sanskrit Inscription. One Special Takrut Metta Maha Saneh is embedded in the front face, 12 Silver Takrut Khun Phaen Maha Sanaeh, and Two Takrut Hua Jai Chai Hying Love Spells are inserted on the rear, and five Takrut Mad Jai are inserted into the base.